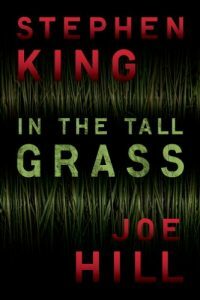 In the Tall Grass is a novella written by Stephen King and Joe Hill. The story was first published in serial form in 2012, in Esquire magazine. Part one was published in the June/July issue and Part two was published in the August issue. Two months later the complete story was made available on Amazon Kindle and has since been made available for other e-reading devices. It is also available as an audiobook. The central characters are brother and sister, Cal and Becky DeMuth. They were born 19 months apart, but are so alike that people call them ‘the Irish Twins.’ They are close, almost joined at the hip close, but when Becky manages to get herself knocked up even Cal has no idea who is responsible for the bun in her oven. At the beginning of the story, Cal and Becky are driving cross-country to visit their aunt and uncle in San Diego. Becky has chosen to stay with them until the baby is born and Cal is accompanying her. Tired of the radio, Cal does not want it on. Tired of the air conditioning, Becky has wound down the window, so when a kid shouts for help, from somewhere deep inside the tall grass at the side of the road, they hear him and stop the car. The kid’s mom is in the grass somewhere as well—she sounds in a pretty bad way—but she’s warning them to stay out of the tall grass. The Kid’s saying his mother is hurt though, so Cal and Becky venture in anyway. What they should have done is listen to the kid’s mother because once they are in the field they get separated from each other and neither one of them can find the way out. It should be as easy as retracing their steps, or jumping up above the grass, finding a marker, and then heading towards it. Things are not that simple in the tall grass. King and son are both excellent writers and I liked the general feel of the story and found some of the descriptions particularly powerful: ‘The dog’s dirty coat looked like a filthy yellow carpet tossed on a heap of bones. Some of that fur drifted— little fluffs of it— on the warm breeze.’ Yep! That’s a dead dog all right and the descriptions of dead people are just as powerful. With scenes of violence towards an unborn baby and even cannibalism, however, In the Tall Grass may be a little too taboo for some readers. Bear this in mind if you are easily offended. The ending of In the Tall Grass is a little predictable, but it works okay and it is such a well told story that I hate to gripe. I would also have liked to discover the truth about a certain stone that has particular significance in the story, but it remained, to the end, an enigma. The story still works without further explanation; it just would have been nice to find out what the heck was happening because, whatever was going on with that stone, it was weird! It is an easy matter to read In The Tall Grass in a single sitting and if you are the kind of person who can usually be found loitering around the horror section at your local bookstore, or your e-reader is filled with dark and nasty tales, there is a good change that you will enjoy this dark and nasty tale. Just bear in mind my earlier warning that some of the scenes describe acts of cannibalism, while others depict violence towards an unborn baby. Bad things happen in the tall grass and although it all fits in with the context of the story, this is one story that may not be everyone’s cup of tea.